The Santa Maria in Domnica. The Santa Maria in Domnica, sometimes called the Santa Maria alla Navicella, lies on the crown of the Caelian Hill (Celio in Italian). The church is old, very old, but its earliest history is shrouded in mystery. The Santa Maria was built over the ruins of the barracks of the Fifth Cohort of Vigiles. The vigiles served as a paramilitary town watch. They were responsible for policing the streets and putting out fires. We do not know when the barracks were abandoned, but it is certain that by the time the Roman-born Pascale Massimi became Pope Paschalis I in 817, there was a church on the site. It is also clear that this church was in a dilapidated state and seriously needed repairs. 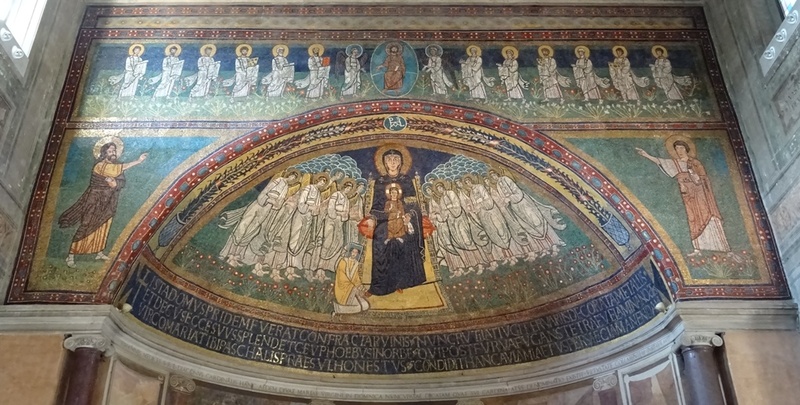 Paschalis, who was also responsible for renovating the Santa Cecilia in Trastevere and the Santa Prassede during his pontificate (817-824), rebuilt the Santa Maria in Domnica and left his monogram and image on the church’s wonderful apse mosaic, which we will examine in a moment. Paschalis was Pope during the so-called Carolingian Renaissance, at a time when Rome had broken with Constantinople, which had supported iconoclasm and had failed to protect Italy against the Longobard invasions. Rome prospered again under the protection offered by the descendants of Charlemagne. However, some twenty years after Paschalis’ death, Charlemagne’s grandsons were fighting amongst themselves and Rome was attacked by Arab raiders. The nave of the basilica. In 1513, the titular cardinal of Santa Maria in Domnica decided to renovate the church. His name was Giovanni de’ Medici and later that year, he was elected Pope and became known to posterity as Pope Leo X (1513-1521). This Florentine Pope hired architect Andrea Sansovino, who was responsible for the church’s portico and first wooden ceiling. A carved sculpture of a small boat was added to the portico, which was moved in the twentieth century. The boat is now part of a fountain that stands in front of the church. Navicella is Italian for “small boat”, which explains the alternative name by which the church is known. In Antiquity, sailors traditionally celebrated the navigium Isidis, a festival in honour of the goddess Isis, at the start of the sailing season. In the ports of the Empire, a small boat was ritually purified and then filled with votive offerings. A priest then put the boat in the water and the wind blew it to the open sea. It was long thought that the navicella of the Santa Maria was an ancient votive offering, but it was actually carved in the sixteenth century. Dominus firmamentum meum et refugium meum et liberator meus Deus meus adiutor meus et sperabo in eum protector meus et cornu salutis meae et susceptor meus. The wooden ceiling, with Saint Peter’s Barque in the centre. Which translates, in the King James Version, as: “The Lord is my rock, and my fortress, and my deliverer; my God, my strength, in whom I will trust; my buckler, and the horn of my salvation, and my high tower. Now that we have mentioned the word “Dominus”, the Latin word “Dominus” means “Lord” or “Master”, so the adjective “Dominicus” means “of the Lord” or “of the Master”. The feminine form is “Dominica”, and it is this form which was shortened to “Domnica” and became part of the church’s name, Santa Maria in Domnica, being mentioned first in 799. The precise origins of the name are clouded by the mists of history. Various explanations have been given, ranging from a reference to a Greek-Roman widow called Cyriaca (Dominica in Latin), who was supposedly martyred in the third century, to a reference to the emperor in Constantinople or his governor in Rome (or Ravenna). Speculation will no doubt continue. 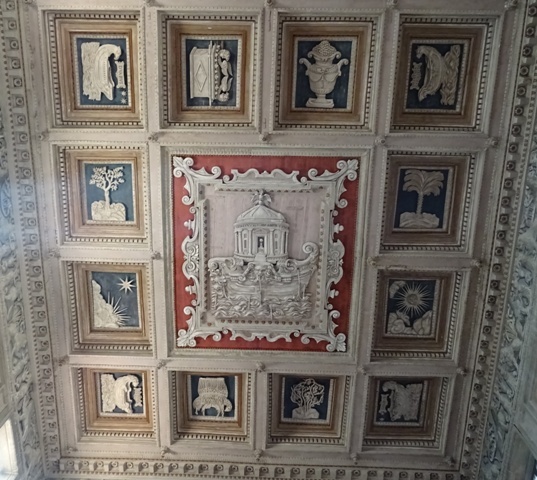 Just below the ceiling we can admire a painted frieze that shows putti or erotes offering water to thirsty lions. The frieze is the work of Perino del Vaga, a Florentine painter and follower of Raphael. Since Perino died in 1547, the frieze is dateable to Giovanni de’ Medici’s renovation of the early sixteenth century. There is a strong connection between the De’ Medicis and lions. Giovanni de’ Medici named himself Pope Leo, “leo” being the Latin word for lion. The painted lions may refer to him. Ferdinando de’ Medici is associated with the famous Medici lions. The unchallenged highlight of the church is the magnificent ninth century apse mosaic. It was commissioned by the aforementioned Pope Paschalis I (817-824) and restored during the pontificate of Pope Clemens XI (1700-1721). In the centre of the Byzantine-style mosaic is the Virgin Mary. She is seated on a throne and is wearing a purple robe. Her head is covered and she is holding a handkerchief in her left hand, the symbol of a Byzantine princess. Baby Jesus is sitting on her lap, but on closer inspection, he does not look like a baby at all. He is, in fact, a miniature adult, an artistic convention at that time. Pope Paschalis is kneeling at the Virgin’s feet and is actually holding her right foot. The square blue nimbus indicates that he was still alive when the mosaic was made (cf. Santa Cecilia in Trastevere). The Virgin is flanked by dozens of angles in white togas. The splendid ninth century apse mosaic. The triumphal arch mosaic shows Christ in the centre, flanked by an angel on either side. Six apostles approach from the left and six from the right. 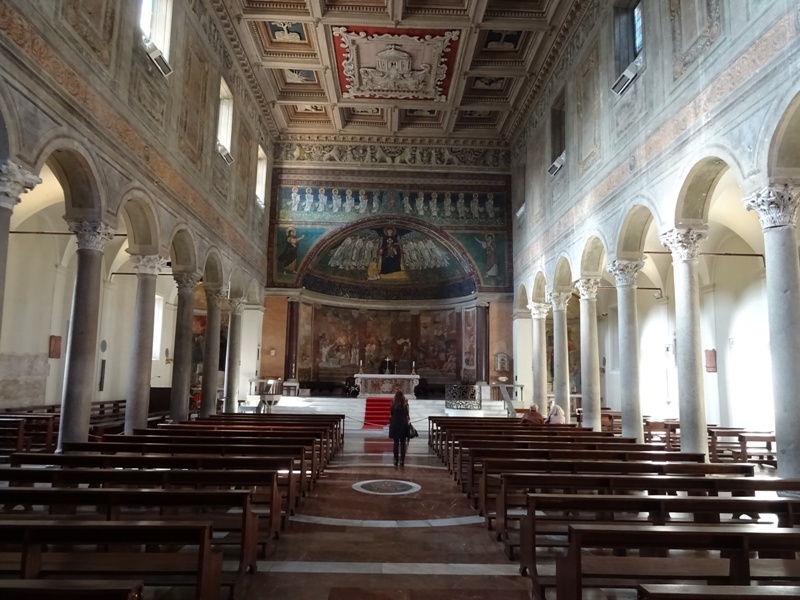 It is difficult to interpret the large figures standing to the left and right of the conch of the apse. The most common interpretation is that they are Moses and the prophet Elijah, although other interpretations have also been given. As with the name “in Domnica”, we just cannot be certain. However, if the figures are indeed Moses and Elijah, we can assume that the beardless young man on the right is Moses and the bearded man on the left Elijah. A similar composition can be found in the Sant’Apollinare in Classe in Ravenna. 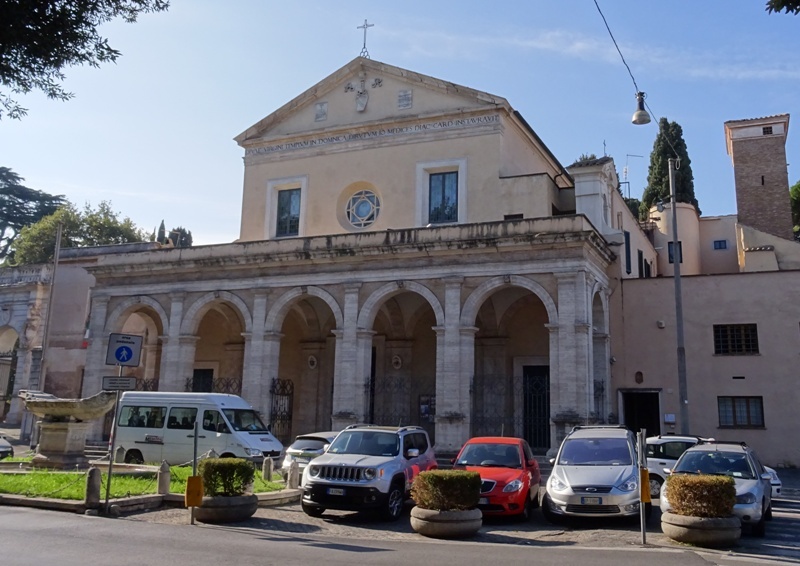 – Santa Maria in Domnica on Churches of Rome Wiki.